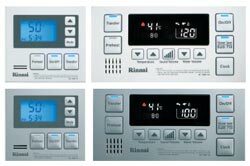 Gas Continuous Rinnai and Rheem Hot Water Systems for Unit and Apartment Blocks. Hot Water units that can delivery Hot Water to multiple Bathrooms. Many Hot Water Systems available for larger Hot Water requirements. If the product you are looking for is not listed then send us a email or call. Send us the exact code if you can, so we can quote the right product.